The Most Ancient and Most Noble Order of the Thistle is an order of chivalry associated with Scotland. While its original date of foundation is unknown, James VII (also King of England as James II) instituted the modern Order in 1687. The Order consists of the Sovereign and sixteen Knights and Ladies, as well as certain "extra" knights (members of the British Royal Family and foreign monarchs). The Sovereign alone grants membership of the Order; he or she is not advised by the Government, as occurs with most other Orders. The sixteen members are required to be Scottish-born, though not the "extra" knights and ladies. The Order's primary emblem is the thistle, the national flower of Scotland. The motto is Nemo me impune lacessit (Latin for "No one provokes me with impunity"); the same motto also appears on the Royal Coat of Arms of the United Kingdom for use in Scotland and on some pound coins. The patron saint of the Order is St Andrew. Most British orders of chivalry cover the entire kingdom, but the three most exalted ones each pertain to one constituent country only. The Order of the Thistle, which pertains to Scotland, is the second-most senior in precedence. Its equivalent in England, The Most Noble Order of the Garter, is the oldest documented order of chivalry in the United Kingdom, dating to the middle fourteenth century. In 1783 an Irish equivalent, The Most Illustrious Order of St Patrick, was founded; since the independence of the greater part of Ireland the Order has fallen dormant (its last surviving knight died in 1974). The original date of the Order's foundation is unknown. According to legend, Óengus mac Fergusa (Angus), King of the Picts, while engaged in battle at Athelstaneford with the Saxon King Aethelstan of East Anglia, saw in the heavens the cross of St Andrew. After he won the battle, Angus is said to have established the Order of the Thistle, dedicating it to the saint, in 787. The tale is not credible, not only because of the unlikeliness of the alleged miracle, but also because the two individuals purported to have fought each other did not even reign during the same century. Another story states that Angus founded the Order in 809 to commemorate an alliance with the Emperor Charlemagne, which is a little less implausible given the Scottish bodyguards employed by Charlemagne. There is, in addition, a tradition that it was instituted, or re-instituted, on the battlefield by Robert I at Bannockburn. Many credit James III, who adopted the thistle as the royal plant badge and issued coins depicting thistles, with founding the Order during the fifteenth century. Others state that James V, who had been admitted to the Order of the Garter in England, the Order of St Michael in France and the Order of the Golden Fleece in the Holy Roman Empire, established the Order of the Thistle in 1540 because he was embarrassed that he had no honour to confer on foreign monarchs. He allegedly conferred membership of the "Order of the Burr or Thissil" on Francis I, King of France. Some Scottish order of chivalry definitely existed during the sixteenth century, but had lapsed by its conclusion. James VII issued letters patent "reviving and restoring the Order of the Thistle to its full glory, lustre and magnificency" in 1687. Eight knights, out of a maximum of twelve, were appointed, but the King was deposed in 1688. His successors, the joint monarchs William and Mary, did not make any further appointments to the Order, which consequently fell into desuetude. In 1703, however, Anne once again revived the Order of the Thistle, which survives to this day. The Kings of Scotland—later the Kings of Great Britain and of the United Kingdom—have served as Sovereigns of the Order. When James VII revived the Order, the statutes stated that the Order would "consist of the Sovereign and twelve Knights-Brethren in allusion to the Blessed Saviour and his Twelve Apostles." In 1827, George IV augmented the Order to sixteen members. Women (other than Queens regnant) were originally excluded from the Order; Elizabeth II, however, allowed the admission of Ladies of the Thistle in 1987. From time to time, individuals may be admitted to the Order by special statutes. Such members are known as "Extra Knights" and do not count towards the sixteen-member limit. Members of the British Royal Family are normally admitted through this procedure; the first to be so admitted was a younger son of George III, HRH The Prince William Henry (later William IV). Olav V, King of Norway, the first foreigner to be admitted to the Order, was also admitted by special statute in 1962. The Sovereign has historically had the power to choose Knights and Ladies of the Order. From the eighteenth century onwards, the Sovereign made his or her choices upon the advice of the Government. George VI felt that the Orders of the Garter and the Thistle had been used only for political patronage, rather than to reward actual merit. 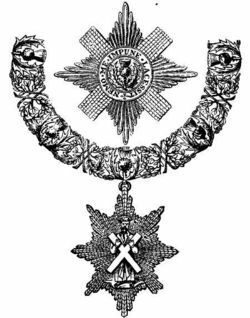 Therefore, with the agreement of the Prime Minister ( Clement Attlee) and the Leader of the Opposition (Winston Churchill) in 1946, the Order of the Thistle returned to the personal gift of the Sovereign. Knights and Ladies of the Thistle may also be admitted to the Order of the Garter. Formerly, many, but not all, Knights elevated to the senior Order would resign from the Order of the Thistle. The first to resign from the Order of the Thistle was John Campbell, 2nd Duke of Argyll in 1710; the last to take such an action was Thomas Dundas, 2nd Earl of Zetland in 1872. Knights and Ladies of the Thistle may also be deprived of their knighthoods. The only individual to have suffered such a fate was John Erskine, 6th Earl of Mar who lost both the knighthood and the earldom after participating in the Jacobite rising of 1715. The Order has five officers: the Dean, the Chancellor, the Usher, the King of Arms and the Secretary. The Dean is normally a cleric of the Church of Scotland. The Chancellor is normally one of the knights, though not necessarily the most senior. The Usher of the Order is the Gentleman Usher of the Green Rod (unlike his Garter equivalent, the Gentleman Usher of the Black Rod, he does not have another function assisting the House of Lords). The King of Arms of the Order, responsible for heraldry, is the Lord Lyon King of Arms, the head of Scottish Heraldry. The Lord Lyon often—but not invariably—also serves as the Secretary. The hat is made of black velvet and is plumed with white osprey feathers. The St Andrew, also called the badge-appendant, is worn suspended from the collar. It comprises a gold enamelled depiction of St Andrew, wearing a green gown and purple coat, holding a white saltire. Gold rays are shown emanating from St Andrew's head. At the right hip of the Riband, the badge of the Order is attached. On the obverse, the badge depicts St Andrew in the same form as the star. On the reverse, it depicts a thistle, on a green ground and surrounded by the Order's motto. However, on certain "collar days" designated by the Sovereign, members attending formal events may wear the Order's collar over their military uniform, formal wear, or other costume. They will then substitute the broad riband of another order to which they belong (if any), since the Order of the Thistle is represented by the collar. Officers of the Order also wear green robes. The Gentleman Usher of the Green Rod also bears, as the title of his office suggests, a green rod. Lord Lyon wears a tabard depicting the Royal Arms. When James VII revived the Order in 1687, he directed that the Abbey Church at the Palace of Holyroodhouse be converted to a Chapel for the Order of the Thistle, perhaps copying the idea from the Order of the Garter (whose chapel is located in Windsor Castle). James VII, however, was deposed by 1688; the Chapel, meanwhile, had been destroyed during riots. The Order did not have a Chapel until 1911, when one was added onto St Giles High Kirk in Edinburgh. Each year, the Sovereign resides at the Palace of Holyroodhouse for a week in June or July; during the visit, a service for the Order is held. Any new Knights or Ladies are installed at annual services. 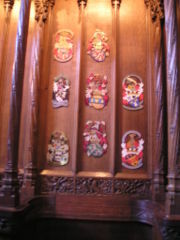 Each member of the Order, including the Sovereign, is allotted a stall in the choir of the Chapel, above which his or her heraldic devices are displayed. Perched on the pinnacle of a knight's stall is his helm, decorated with a mantling and topped by his crest. Under the laws of heraldry, women other than monarchs do not bear helms or crests; instead, the coronet appropriate to the Lady's rank is used (see coronet). 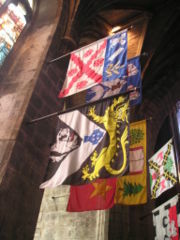 Unlike other British Orders, the armorial banners of Knights and Ladies of the Thistle are not hung in the chapel, but instead in an adjacent part of St Giles High Kirk. 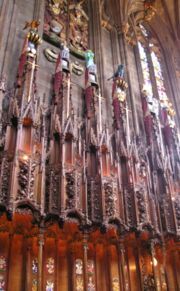 The Thistle Chapel does, however, bear the arms of members living and deceased on stall plates. These pieces of brass are affixed to the back of the stall and display its occupant's name, arms, and date of admission into the Order. Upon the death of a Knight, helm, mantling, crest (or coronet or crown) and sword are taken down. The stall plates, however, are not removed; rather, they remain permanently affixed somewhere about the stall, so that the stalls of the chapel are festooned with a colourful record of the Order's Knights (and now Ladies) since 1911. The Royal arms encircled by the circlet and collar of the Order. The badge of the Order is depicted suspended from the collar. Knights and Ladies of the Thistle may also use the circlet, collar and badge on their arms. Knights of the Thistle prefix "Sir," and Ladies prefix "Lady," to their forenames. Wives of Knights may prefix "Lady" to their surnames, but no equivalent privilege exists for husbands of Ladies. Such forms are not used by peers and princes, except when the names of the former are written out in their fullest forms. Knights and Ladies use the post-nominal letters "KT" and "LT," respectively. When an individual is entitled to use multiple post-nominal letters, "KT" or "LT" appears before all others, except "Bt" or "Btss" ( Baronet or Baronetess), "VC" (Victoria Cross), "GC" ( George Cross) and "KG" or "LG" (Knight or Lady of the Garter). Knights and Ladies may encircle their arms with the circlet (a green circle bearing the Order's motto) and the collar of the Order; the former is shown either outside or on top of the latter. The badge is depicted suspended from the collar. 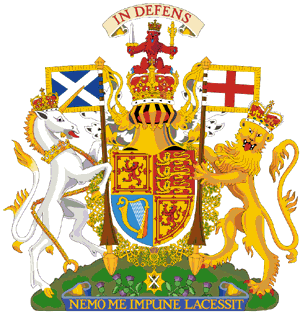 The Royal Arms depict the circlet, superimposed over the collar, of the Thistle only in Scotland; they show the Garter in England, Wales and Northern Ireland. Knights and Ladies are also entitled to receive heraldic supporters. This high privilege is only shared by members of the Royal Family, peers, Knights and Ladies of the Garter, and Knights and Dames Grand Cross and Knights Grand Commanders of the junior orders.